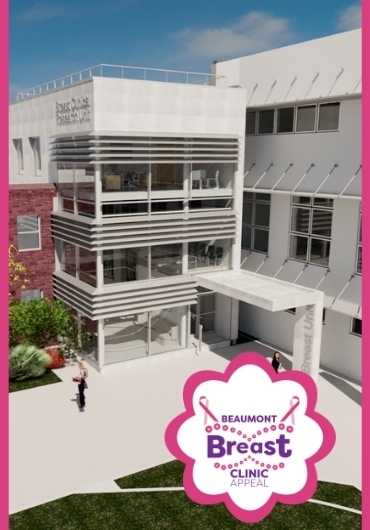 Beaumont Hospital Foundation, in conjunction with the staff of the Breast Care Service, has launched a €1million fundraising appeal to complete the funding of a stand-alone Breast Clinic at Beaumont Hospital. To be located adjacent to the RCSI Smurfit Building and the Emergency Dept, the project has already secured funding of €4million. We are now seeking widespread public support to fundraise a further €1million to complete the build of the three-storey facility which will become a single centre for all breast outpatients needs. A move to a dedicated unit will radically improve the patient experience for patients attending the Breast Care Service. More consultation rooms will facilitate more clinics and reduce waiting times. Access to the the very latest breast imaging technology and the ability to carry out certain procedures on-site will reduce the number of patient visits and improve overall efficiency. Once built, patients will be seen in this light-filled, spacious and modern clinical environment which will offer a calmer, more efficient and holistic patient experience. This state-of-the-art clinic will focus solely on providing assessment and treatment facilities for breast patients and is scheduled to open in September 2020. At present, a limited number of breast clinics can be accommodated weekly. The dedicated building will be able to facilitate clinics on a daily basis if required. The new building will result in huge improvements in service efficiency with the breast multidisciplinary team physically able to work in close proximity for the first time. Currently patients are required to trek around the hospital to various departments to complete their assessment. The new building has been designed to make it simple for patients to navigate comfortably through their assessment which will all take place in the one building. A dedicated image-guided procedure room will make it possible for certain breast lumps to be removed under image-guidance, avoiding surgery for relevant patients. Diagnostic imaging capabilities will be upgraded to include the addition of two tomosynthesis 3D mammography machines which offer significant advantages in cancer detection for younger women. The Cancer Clinical Trials and Research Unit will be located on the building's third floor, integrating clinical trial opportunities for patients. The work of the Breast Care Nurses will be greatly improved through access to patient counselling and treatment rooms.